Not to sound ungrateful, the roast sounds great, but where’s the pudding to go with it? I’d settle for a nice apple crumble with custard. Enjoy the roast and FSC, C-W-S. Are you really going to be on vacation? Ill try to take one though I’m very sorry I’ll miss you by a very short time. 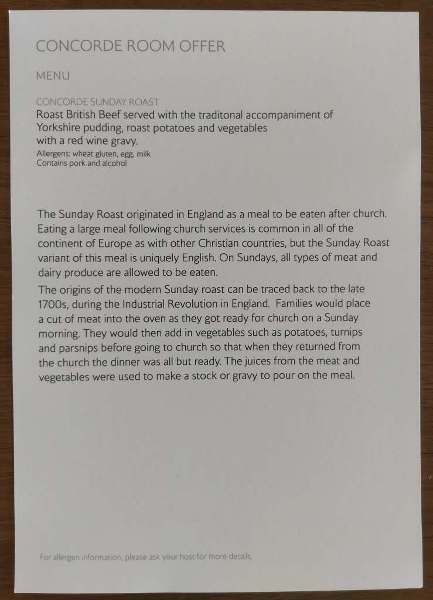 This has been flagged by some of the CCR (non gender) brethren already but from today, on Sundays from 12 midday onwards, CCR is offering a Sunday Roast option. This is in addition to the existing Dining and Lounge menus, not replacing it. 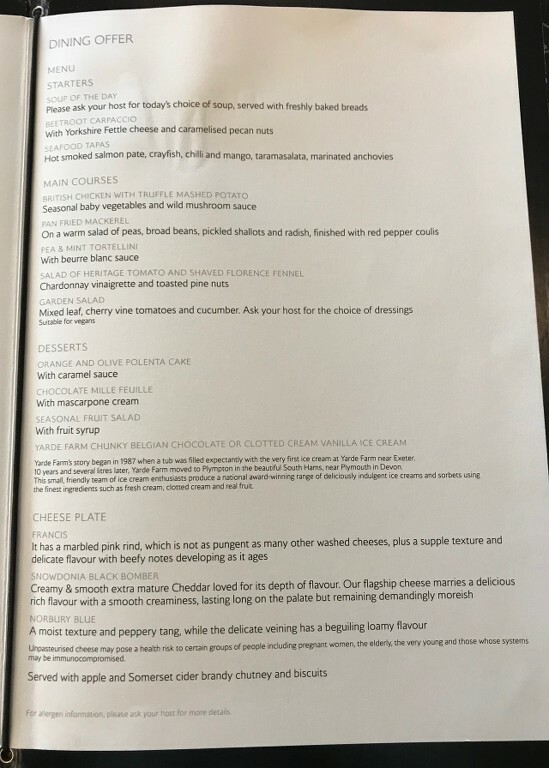 My flight to FSC leaves just after midday so I'll leave the honours of the first photo of the Sunday Roast meal to someone else, but in in the meantime, here is the menu. I assure you I am working tomorrow, shirt and tie! Here we go! With a glass of Chateau Lagrange! Staff all keen on knowing what I think which is that both roast and wine are very nice!!! Mapman, TravellerFrequently, corporate-wage-slave and 3 others like this. I have to admit that there's not much I appreciate less about the gamut of British staples than the de rigeur Sunday lunch. But, fair play to the CCR bosses, it's good to see further thought being put into the offering. Yes I do think that the thought matters. It's not Hawksmoore, the Yorkshire pudding won't remain in your memory as one of the best you've had or anything and the meat doesn't really "taste" roasted (more slow cooked) but it is an enjoyable lunch and I'll look forward to having it again! Asparagus starter, cheese plate, chocolate millefeuille, and - exceptionally for me - a second glass of wine as the Lagrange is an excellent choice in my view and that makes for a highly enjoyable lunch! Well done! TravellerFrequently, corporate-wage-slave and Tobias-UK like this. I just had the Sunday Roast also. The CCR staff seem to be pushing it as the new addition to the menu - feedback was solicited. The cheesecake hit the spot nicely. Overall, very good to see that BA are trying to improve the variety in the CCR. The staff were obviously happy to see new additions to keep their customers happy. TravellerFrequently, orbitmic, corporate-wage-slave and 1 others like this. Thanks for posting. I knew this was coming but didn't know the date, it's certainly been CCR gossip for the last few months. I have included this in the Dining Menu photo guide and used orbitmic's photo. orbitmic and corporate-wage-slave like this. One thing nobody seemed sure about was whether the roast will always be the beef or will change either every month or every other month or every time. I asked the "guy in jacket" who kindly came to introduce the roast, pour the gravy and ask for my feedback afterwards and the other staff members who came to ask me about it afterwards, but nobody seemed to be entirely sure. They were, however, all clearly proud of this new introduction ("are you going to like it!") and happy to serve it, which I thought was very nice (I quite like it when people seem proud of what they can offer customers and have felt the same with some crew since the introduction of the new CW catering. It's nice to witness too). TravellerFrequently and Tobias-UK like this. New June menus now in the CCR. Dining menu below courtesy of 1K, I haven't got the new lounge menu yet. As well as the usual rotation there is now a new ice cream option. Photo guide is updated. I have a photo of the chicken dish. Any photos of the beetroot carpaccio, tomato and fennel salad, orange cake, and new cheese selection would be very much appreciated. haroon145 and kosy91 like this. Just tried the tomato-fennel salad as a starter. Sadly pretty tasteless, even the tomatoes looked pretty but were floury and uninteresting. Not helped by a very loud phone conversation a few tables away. Sigh... I stuck to old items for the rest (and forgot to take a photo of the salad I'm afraid).